Pure Non-Scents Ag+ Activated Carbon Cloth Face Masks let you breathe inside when breathing outside is unpleasant, obnoxious or down right unhealthy.The Pure Non-Scents Ag+ CHARCOAL FACE MASK protects against virus outbreaks as it is specially impregnated with silver. Applications are numerous, from hospital workers, homemakers, athletes, those in environmentally risky conditions, smoke allergies, sufferers of Multiple Chemical Sensitivities (MCS), travelers, wherever fresh clean air is not available, the Pure Non-Scents CHARCOAL FACE MASK can purify the air for you to breathe safely. Antibacterial PNS face mask in hospital setting.Light, comfortable, perfect for most health care applications giving exceptional protection against odors and VOCs (volatile organic compounds - see Link below). But that's not all. Smoke and smog, fragrance chemicals and baby diapers, beauty salons and airplane air, diesel fumes and hospital laser plume, cow barns and photo labs, from downtown LA to Khatmandu, these fit-in-your-pocket face masks give instant breathable relief. Leaving on a jet plane, heading out into rush hour traffic, visiting sick friends, why not tuck one of these Pure Non-Scents Face Masks (with activated Carbocloth) into your travel bag, glove compartment, or purse. You may get several weeks to months of life depending on amount of use. I would very much recomend Flat-D to anyone who needs odour reducing equipment, I work in a Nursing home and had trouble dealing and cleaning up residents bowl movments and feared I was going to have to leave my job becuse of this. I purchased the Flat-D face mask and it made a complete change to my job. Im now able to deal with the obsticle i had with no more gagging or vomiting during cleaning a resident. Thanks to Flat-D, Im able to keep my job I enjoy. 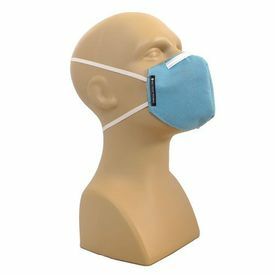 The mask is awsome, lightweight, folds flat to fit in a scrubs pocket, fillters 100%, comfortable and a all round excellent product and would not hesitate to purchase another when the charcoal filter runs out. I will for sure be purchasing another, even buying a bulk order of them. Customer service is awsome and very helpful and understanding to my situation. I got my product super fast. Flat-D is a superb company to deal with and highly recommended. My son, Matthew, is four months old and changing his dirty diapers can be an unpleasant job. I tried your new product, the Mask-D, and I couldn't believe how well the mask worked. Normally I would be holding my breath or taking very short breaths through my mouth because the odor from Matthew's diaper was so overpowering. The Mask-D eliminated the stench from the diaper. Needless to say, I will be using the Mask-D whenever I change Matthew's diaper. In fact the Mask-D now travels with Matthew's diaper bag. Thank you for such a wonderful product!